In this chapter you'll find available configuration options. Alert - show an error message using window.alert. Console - logs error message to console. Ignore - suppresses the default error messages. Allows creating new events by double click. Wraps the updateView and getCurrentView calls (client-side methods that cause re-drawing of the scheduler ) with a several milliseconds timeout. Config is used in order to minimize the number of programmatic redrawing of the layout and increase responsiveness of the UI. "Says" to use the extended form on new event creation by drag or by double click. "Says" to use the extended form on event double click. Allows creating new events by drag-and-drop. 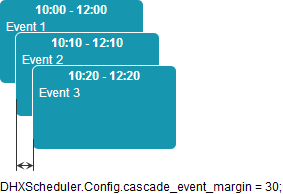 Highlights the event's duration on the time scale when you drag an event over the scheduler. If the option is set to true then the lightbox can be dragged by the header. Allows moving events by drag-and-drop. Allows resizing events by drag-and-drop. "Says" to open the lightbox on new event creation. Activates the read-only mode for events. Disables the keyboard navigation in the scheduler. Specifies whether all instances ("true") or just the selected one ("false") should be dragged while dragging events assigned to several sections of the Timeline or Units view. Enables the possibility to resize single-day events in the Month view by drag-n-drop. Requires DHXScheduler.Config.resize_month_events to be enabled as well. Specifies the delimiter that will be used to separate several sections/units in the related data property of the event. By default, sections should be passed as comma-separated IDs. "Says" to show a progress/spinner while data is loading (useful for dynamic loading). Defines whether scheduler element and minicalendars should have "application" WAI-ARIA role. Sets the minimum value for the hour scale (Y-Axis). For more details, see the illustrative example. Sets the maximum and minimum values for the time selector in the lightbox to the values of the last_hour and first_hour options. Sets the start value of the hour scale of a view (24-hour format). If the parameter is set to true, a week will start from Monday (otherwise, from Sunday). Sets the minimum step (in minutes) for the allowed event's start and end date values, i.e. if time_step=30, the event can start/end only at time multiple of 30 minutes: 8.00, 8.30, 9.00 and so on. Sets date format that will be used while specifying dates through API methods (format string variations). Used to parse incoming dates. Sets the format for the date in the header of the week and units views (format string variations). For more details, see the illustrative example. Default value: "%D, %F %j"
Sets the date format using by the templates day_date, week_date, day_scale_date for setting date in the headers of the day, timeline, week, weekAgenda and units views (format string variations). For more details, see the illustrative example. Default value: "%j %M %Y"
Sets the format for Y-Axis items (format string variations). For more details, see the illustrative example. Sets the format for the header of the month view (format string variations). For more details, see the illustrative example. Sets the format for the day in a cell of the month and year views (format string variations). For more details, see the illustrative example. Sets the format for the date in the sub-header of the month view (format string variations). For more details, see the illustrative example. Sets the date format that is used while converting a string from an XML file into a date object (format string variations). Sets the default background color for the events retrieved by the client-side showEvent() method. Used only in the showEvent() method context. Sets the default font color for the events retrieved by the client-side showEvent() method. Used only in the showEvent() method context. Specifies whether events retrieved by the client-side showEvent() method. Used only in the showEvent() method context. Enables/disables the touch support in the scheduler. If touch is enabled, the scheduler tries to detect the touch device by analyzing the user-agent string of the browser. If a touch device is detected, it enables the touch support. Defines the time period that is used to differentiate the long touch gesture from the scroll gesture (in milliseconds). If you set the 0 value, the user won't be able to drag events. Enables the persistent touch support, no matter what kind of device is used. Enables/disables prompting messages in the right up corner of the screen. Enables/disables dhtmxlScheduler tooltips on touch devices. Activates/disables checking of limits. It makes sense to disable this option when you don't set any limits and just make some highlighting or mark the current time. It will increase the performance speed. But if you have some limit set, disabling this option will disable all the "blocking" methods. Defines whether the specified highlighted (marked) time spans should be displayed. Sets the right border of the allowable date range. Sets the left border of the allowable date range. Defines whether the date specified in the "End by" field should be exclusive or inclusive. By default, the date set in the "End by" field is exclusive. Ask - before the lightbox is opened, a message box alerts and asks the user whether he will edit a certain instance or the entire recurring event. Instance - the lightbox opens straight for editing a certain instance of the event. Series - the lightbox opens straight for editing the entire recurring event. The property allows working with recurring events independently of time zones. If the option is enabled timestamps of events are stored as UNIX time. Watch out! The option is intended for "newborn" schedulers and won't affect already running ones. Sets the date format for the "End_by" field in the "recurring" details form. Prevents including past days to events with the "weekly" recurrence. Stores a collection of icons visible in the side edit menu of the event box. For more details, see the illustrative example. Stores a collection of icons visible in the side selection menu of the event box. For more details, see the illustrative example. "Says" to show multi-day events in the regular way (as one-day events are displayed). Default - to show all multi-day events as lines in the upper part of the scheduler (the standard display mode for multi-day events). Short - to show only multi-day events that last less than 24 hours (starts one day and ends another) in the regular way. Multiday - all multi-day events in the regular way. If the option is set to true, when you change the start event time or date, the end event time and date will be changed automatically in order to make the event duration value equal to 60 minutes. Stores a collection of buttons resided in the left bottom corner of the lightbox (see details). Stores a collection of buttons resided in the right bottom corner of the lightbox (see details). Sets the maximum number of events in a cascade. Events that 'exceed' the set value will be drown over the cascade. For more details, see the illustrative example. 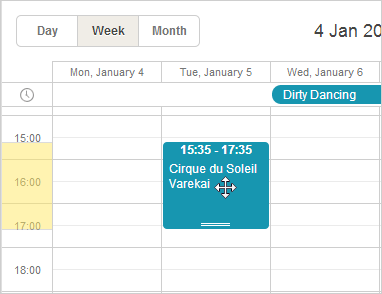 By default, events scheduled to the same time are displayed one by one. If you want to present such events as a cascade, set the option to true. For more details, see the illustrative example. Sets the left margin for the cascade of events. For more details, see the illustrative example. Moves the "mark_now" marker to the specified date. The option is available only if the DHXScheduler.Config.mark_now option is set to true. Sets the initial duration of an event in minutes. By default, the dhx_terrace skinned scheduler presents the views tabs on the left side. To place the tabs on the right side, set the option to false. If the option is set to true, entry fields in the "Time period" section of the lightbox are blocked and the time period is set to a full day from 00.00 of the current cell date until 00.00 of the next day. The maximum width of the Google Maps popup marker in the map view. Sets the initial zoom of Google Maps in the map view. If the locations of events have no latitude and longitude values in the database but this option is set to true, the coordinates will be defined automatically while event loading. Some browsers open up the opportunity to determine your location. And if this option is set to true, such opportunity will be offered while map loading. Sets the type of Google Maps in the map view. HYBRID - displays a transparent layer of major streets on satellite images. ROADMAP - displays a normal street map. SATELLITE - displays satellite images. TERRAIN - displays maps with physical features such as terrain and vegetation. Sets the zoom that will be used to show your location if you agree to a browser offer to show it. If the option is set to true then the day and week views will have marker displaying the current time. For more details, see the illustrative example. Minimal height of grid view that can be set by ContainerAutosize extension. Minimal height of map view that can be set by ContainerAutosize extension. A click on the button opens the edit form for editing text of the event. Any outside click closes the form and cancels your changes. To prevent this and save any changes made in the form, set the option to true. If the option is set to true, the current scroll position is preserved while navigating between dates of the same view (through this panel - ). Allows you to prevent short events from overlapping. For more details, see the illustrative example. If the option is set to true, server-side dates will be converted from UTC to a local time zone and backward while sending data to the server. If the option is set to true, each time when an event is updated, the whole view will be refreshed (not only the changed event). It smoothes size re-calculation, but results in higher CPU usage. By default, an event occupies just a part of the cell width and leaves the place for the left-side menu. Set the option to true and events will start to occupy the whole width.